So, I love music. I love Christmas music and Christmas carols. Earlier this month I was thinking that if I ever were to record an album, I'd love to just do a Christmas one first. Because I love Christmas songs and I love singing them. I'm probably never going to record an album. I do love to sing and lead and I think I do a pretty good job, but I also don't have any illusion that I'm the next Darlene Zesch, although had the timing been right and I had the right break, I'm pretty sure I could have been Amy Grant. I have the curly hair and all. I used to roller skate to her "Straight Ahead" album playing on a "My First Sony Cassette Player" on a large square of concrete in our condo complex when I was in 4th or 5th grade. If they had figure roller skating in the Junior Olympics, or maybe a human video on roller skates category, I definitely would have been a contender. I'll go ahead and let you soak that image in for a moment. As a kid, my favorite Christmas song was Away In Manger. It was about the Baby Jesus. And I loved babies and I couldn't wait to have my own someday (yes, even when I was a kid). We listened to this album every Christmas for years on cassette. Every December when we unpacked the Christmas boxes, we were always excited to find it. I just spent 30 minutes trying to find it online. I can't find any downloads, which is a bummer. But I think my mom still has the cassette. I may have my kids listen to it in the car, since that's the only place we still have a cassette player. 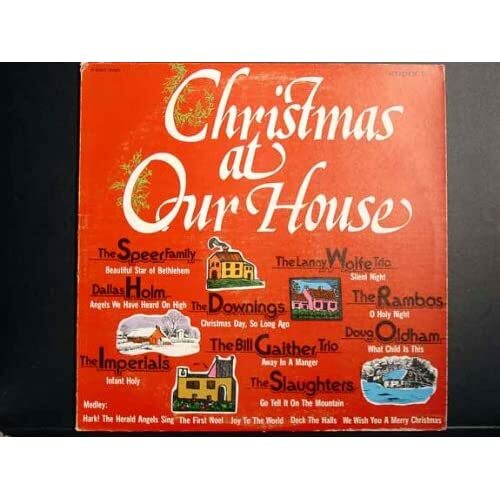 It is a narrated Christmas album about family and tradition and was a lot of fun to listen to. I have no doubt I could quote the dialogue and all the songs if it were playing. When I was in high school, this album came out and I'm pretty sure it was a Christmas gift that year. Because I love me some Amy Grant. And if we ever met, I'm pretty sure we'd be friends because she has a daughter named Corinna. I was SO bummed that the Amy Grant/Michael W. Smith concert a few years ago was so pricey. I would have LOVED to go. It's no surprise that Amy co-wrote my all-time favorite modern Christmas song, "Breath of Heaven." I love the lyrics, the thought of the emotions Mary must have experienced, the "haunting" nature of the music. One day, I hope to be able to sing/perform that song at a Christmas service. It's on my not-yet-written bucket list. In the past few years, I've gained an appreciation for some of the traditional but not as common Christmas songs. This year I've been studying and teaching some on Advent, a traditional approach to the weeks leading up to Christmas. There is a tension in Christmas. We anticipate it, and it happens, but then life goes on and we wonder, did we miss something? The truth is, we did. We do. Christmas celebrates the birth of Jesus, the Messiah, the one who came to take away our sins and offer salvation. But his coming wasn't everything. The story isn't complete until he comes again and that is what Advent is about. I never took the time to understand and meditate on the lyrics of "O Come, O Come Emmanuel." What does it mean to "ransom captive Israel?" But oh the richness of that line and the rest of the lyrics. Steeped in Old Testament prophecy and promises about Jesus. It's one of my favorites right now. "What Child Is This" is another of those well-known yet mysterious songs. I love it. These songs are haunting and full of minors and discordant. They leave you hanging. Waiting, wanting. A few albums I've been enjoying lately, O Holy Night by Sara Groves and Songs for Christmas by Phil Wickham. Usually I just turn on my Pandora holiday station and enjoy the variety. So, what Christmas songs--modern and traditional do you like? I could go on and on about other songs and the memories tied to them, but it's my day off and I want to go cuddle with my kids.